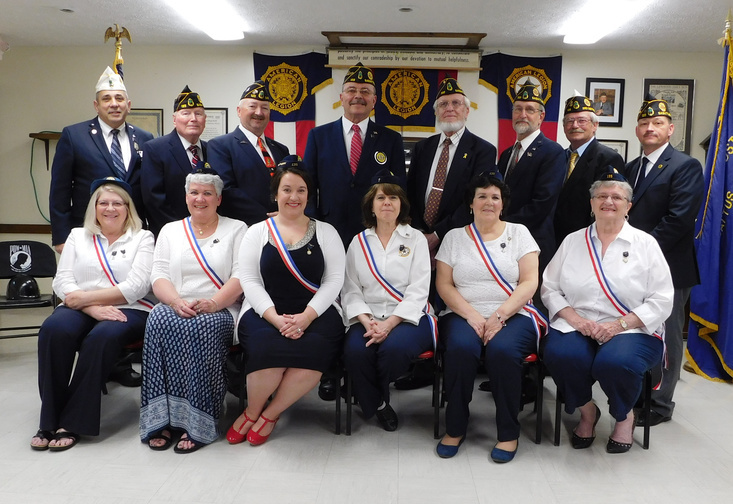 SABATTUS — Sabattus American Legion Post and Auxiliary recently installed its unit officers for 2017-18. The following officers were installed to the Harry J. Conway Post 135 Auxiliary by the Installing Officer Michelle McCrea: Jen Caron, president; Joan Caron and Denise Michaud, vice presidents; Theresa Bradshaw, secretary/treasurer; Debra Devoe, chaplain; and Joan Fournier, sergeant-at-arms. Each officer was presented with a pin and sash that signifies the office of their appointment. After the installation of the auxiliary officers, Ron Caron conducted the installation of Legion officers. He was assisted by Steve Caron, past post adjutant, who acted as his installation sergeant-at-arms, and David Devoe, post chaplain, who acted as installation chaplain. The 2017-18 Sabattus Harry J. Conway American Legion Post 135 officers are Donald Caron, post commander; Joseph Michaud, first vice commander; Joseph Tetreault, second vice commander; James Rancourt, adjutant; Anthony “Tony” Culpovitch, finance officer; David Devoe, chaplain; Harvey Moses, sergeant-at-arms; Gordon Smith, post historian; and Amedeo Lauria, post service officer. The post currently has a vacancy in the position of Americanism officer. At the conclusion of the installation, Caron, the new commander, was presented with the gavel of his office. During his speech, Caron talked about the projects and programs that he would like to see put in place for the upcoming year. Eligible wartime veterans interested to learn more about the American Legion can visit www.americanlegionpost135.sabattus.net.